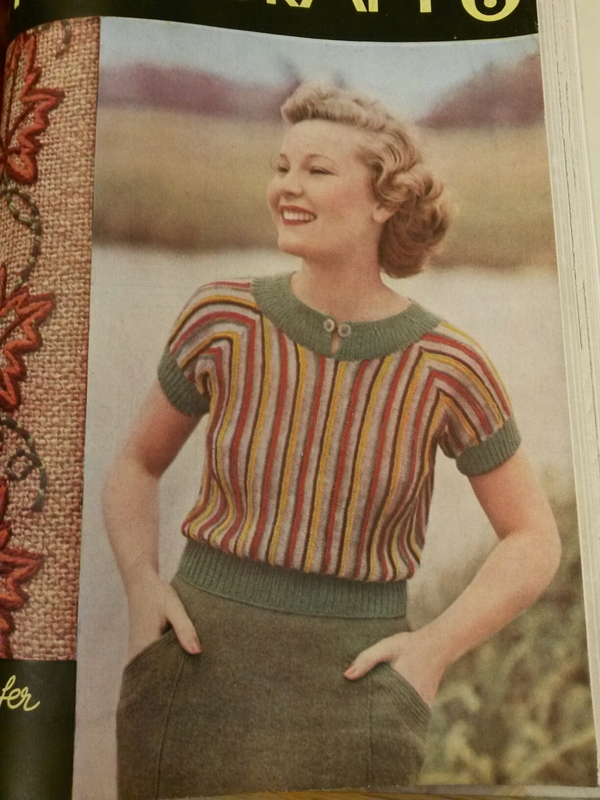 Free Vintage Knitting Pattern: Sideways Knit Short Sleeved Jumper That is Just Super! OMG Isn’t this fabulous! and it’s knitted sideways with multi-coloured stripes. It’s also wearable in Spring and Summer as it has short sleeves (and here in the UK it’s going to be the hottest I’ve ever known it tomorrow at 33 degrees C, so obviously thick winter sweaters aren’t on my mind at the moment). It is green, fawn, rust, yellow and brown and is for a 33-35 inch bust. I’ve spotted that a couple of the other Stitchcraft Leaflets I have scanned were originally featured in the monthly Stitchcraft Magazine, so here it is as the cover photo. I’ve knitted it too in completely different colours to the pattern. I posted it on Ravelry if you fancy a nosey? It layers rather well over a jersey roll neck. Can you post a link to your Ravelry project? I’d love to see it! Caroline, I don’t know to post a link? But if you look for me – Claire Gittins – on Ravelry you’ll find my Starring stripes jumper. I think I have a colour leaflet of this pattern, I will have a look.